The Miniature Donkey should be attractive, sound, strong and sturdy. The animal should be well balanced as the various parts blend together in a nicely coupled, compact picture. The animal should have an alert expression and "presence"; jennets should look feminine and slightly more refined and jacks should be relatively stocky and masculine. 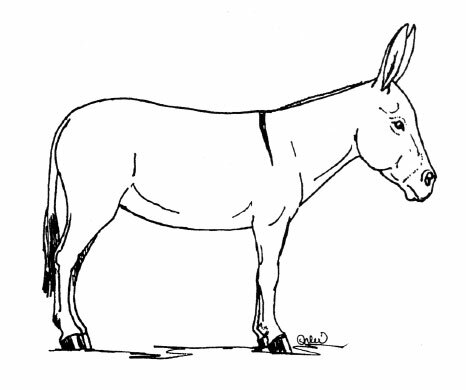 A maximum height of 36" at the withers measured at 3 years is accepted by the Miniature Donkey Registry. A minimum height of 30" is strongly recommended by NMDA to prevent loss of potential reproductive fitness including foaling difficulties. Small size may also adversely effect conformation and balance. Overall bone should be strong and in proportion to the size of the Donkey and muscle development. Overall balance in conformation and adequate bone is necessary for work, such as carrying packs and pulling carts efficiently.